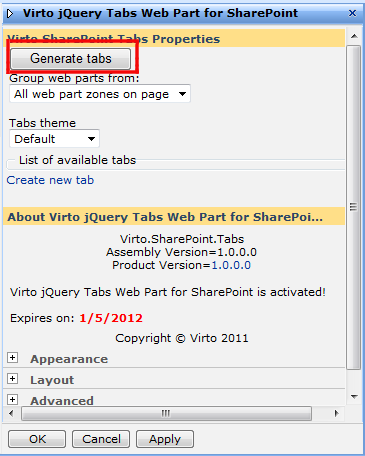 To group controls into tabs, go to web part settings (“Modify Shared Web Part” button) and use “Generate tabs” button. All web part zones on page (in this case you can group tabs from all web part zones placed on the site page). Let us choose “All web part zones on page” option. The tabs will be generated automatically – one tab for every web part present on the page.